Join us for an evening of food, fun, and supporting community-building projects! We host a public dinner, where, for a minimum donation of $10 you get soup, salad, bread, and a vote. At the event, the audience listens to pitches, eats, talks, shares resources, and votes on the project they think benefits Vancouver the most. Four groups pitch their community-building projects from a wide range of fields: urban agriculture, social justice, social entrepreneurship, education, technology, the arts, and more. Each presenter has 4 minutes to share his/her idea and answer a few questions from the audience. At the end of the night we count ballots, and the winning project goes home with all of the money raised ($500-$1,000). 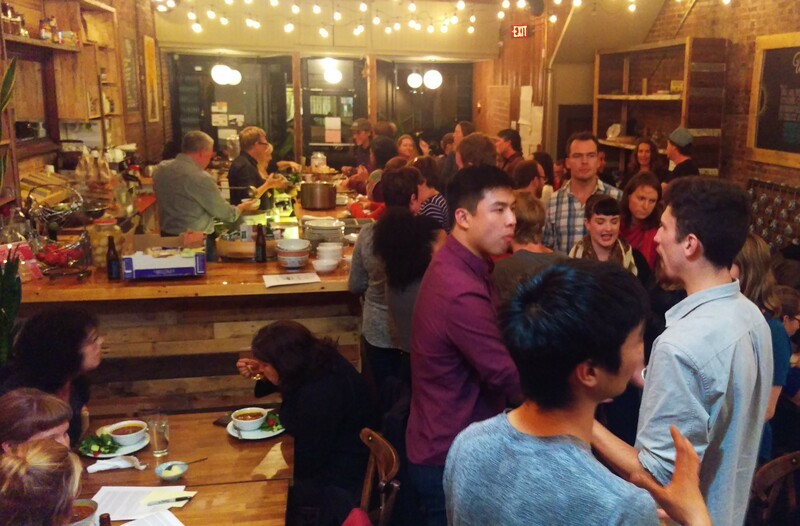 Attendees leave with full bellies, perhaps with new friends, and knowing they have invested in a friendlier, more connected Vancouver.